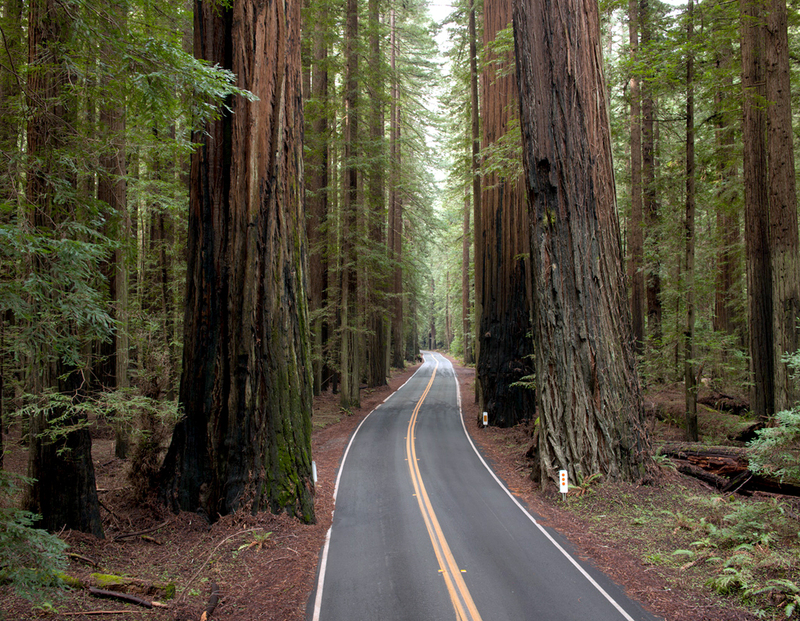 At a pull-off along the Highway of the Giants in the Redwoods of Northern California a lumbering, topheavy RV pulled to the side of the road and stopped. Its driver got out, walked to a spot about 25 feet behind the vehicle, raised his camera, snapped one picture, got back in and drove off. I’d seen many people line the wife and kids up against a scenic backdrop, or ask Aunt Emily to smile in front of the Grand Canyon, but this was the first time I’d seen anyone take a picture of his truck. In a way, it made sense. The redwoods are notoriously difficult to photograph. They seem like they’d make wonderful subjects: They are green, tall, impressive and make their own weather. But they only grow in the lowlands and river bottoms and are surrounded by dense hills. There is no way to step back and get them all in perspective. Heck, there is no way to step back and get them all in the viewfinder. One has to be satisfied with bits and chunks of tree trunk surrounded by ferny growth. And even that is disappointing photographically. I set up my camera at an especially impressive trunk, maybe 15 feet in diameter, covered in green moss. In front of it were the biggest ferns I had ever seen in my life, with fronds that were six feet long. I looked at them carefully in my viewfinder, with my camera set on a tripod. I groaned. Since everything was of the same immense scale, the picture looked like an ordinary patch of ferns in front of an ordinary tree. The only solution is to put something whose size you know in front of the tree, something like the wife and kids — or your RV. As an aside, I want to mention the obsessive proclivity of the West Coast states for naming every Department of Transportation speed bump in memory of someone. The Muriel O. Ponsler Memorial Wayside was little more than a widening in the road so cars could pull over and see the ocean. 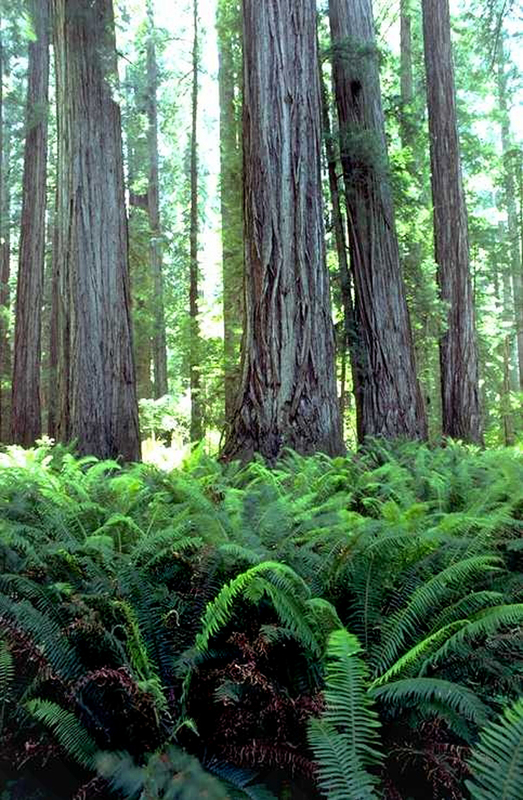 There is the Joseph and Zipporah Russ Memorial Grove in the redwoods. The habit is essentially harmless, but it helps if you pay attention to the name you are commemorating. We soon passed over a bridge named for Elmer Hurlbutt. The Hurlbutt Bridge: Someone was asleep at the switch when that got named. But what I meant to talk about when I started writing this column was why people make photographs when traveling. The answer seems simple at first: They make pictures to help them remember the trip, or so they can show their friends that they were, in fact, to the redwoods or the Grand Canyon. But after years of watching people raise their Nikons to their eyes, I am not so certain anymore that the pictures are always aids to memory. Because the pictures are made so offhandedly, and their makers so quickly jump back in their RVs and drive off to the next natural wonder, I believe they must use the photographs instead as a substitute for memory. Instead of really experiencing the woods, with its dripping humidity and spongy forest floor, its green smells and muffled silence, they use the camera to arrest a slice of vision that they can take home and dissect, using the image rather than the trees as their primary experience of the redwoods. It may be that we have become so acculturated to the television reality that the aromatic reality of primary experience no longer retains its validity. It must be transmuted into a Kodak moment — metamorphosed from sense experience to media experience — before it is taken seriously. But, more likely, people have always done the same, zooming past the magic to chalk up another name on their life list of scenic destinations.